Boss Life Foundation, Justin The Lawyer, HUSL Lifestyle Apparel and Body District have partnered to present The First Annual I45 Pushup Challenge, taking place on Saturday, April 6, 2019 at 9:00am at Body District, located at 5080 Addison Circle Drive, Addison, TX 75001 and One2One Training Center, located at 6322 Richmond Ave, Houston, TX 77057. This event will feature many local influencers and celebrities from each city such as: Slim Thug, Z-Ro, Dorrough (Six 3), Donald Mitchell, former Tennessee Titan, Hardbody Kiotti and J Mac of 97.9 The Box in Houston and DJ Kayotik of 97.9 The Beat in Dallas. This team of organizers is proud to bring this event to Dallas and Houston for the first time of what will be an annual campaign. 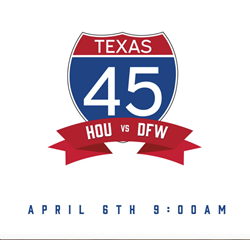 The I45 Pushup Challenge is a one-hour pushup challenge designed to fund the dreams of terminally ill and or disabled Texas children. 75 participants in Dallas will compete against 75 participants in Houston and will push up to raise money based on their pledges received. The team with the most pushups done collectively at the end of an hour will be crowned the strongest city. However, the real winners will be the families, who will benefit from the generous tax-deductible donations from community businesses and individuals. The Boss Life Foundation, a Texas nonprofit, will award 100% of the funds raised to selected families in Dallas and Houston through the Dream Award. A selection committee will choose awardees based on nominations by families. This award can be used to fund a trip that the child dreams of, to pay for the costs of access construction for a special-needs child, or to satisfy medical costs for necessary devices or procedures. In order to meet this goal, we are asking for sponsorships from local businesses and individuals. 12. Once confirmed, you’ll be taken to the confirmation page and are ready for the I45 Pushup Challenge!